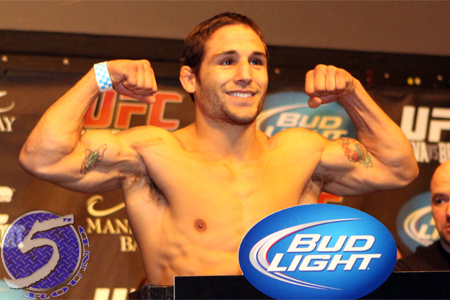 Chad Mendes (pictured) is 17 days out from trying to avenge his knockout loss to reigning featherweight king Jose Aldo at UFC 179. However, it’s impossible to talk about the 145-pounders without mentioning one Conor McGregor – particularly since McGregor called out “Chad ‘Mini’ Mendes” following last month’s victory over Dustin Poirier. In MMA, matchups are almost everything. McGregor hasn’t been pitted against a top-tier grappler since joining the UFC four fights ago, so nobody has seen what “Notorious” can do off his back. In fact, through 18 professional fights (16-2), McGregor has finished 14 victims via some form of knockout. Furthermore, McGregor’s two defeats came via submission. Could a grappler be McGregor’s kryptonite? More importantly, how soon is the UFC willing to put their new golden boy at risk in order to find out? Per usual, McGregor doesn’t seem to be too worried about much. “4 fights in and I own the game,” McGregor tweeted Tuesday.